Nicole "Snooki" Polizzi and Jionni Ready for Baby No. 3? It's already been years since Nicole "Snooki" Polizzi hung up her fist pump and walked off the Jersey Shore boardwalk—and her new life is certainly different. With over 40 pounds lost and two children that look exactly like her, the 28-year-old reality star has emerged from her past life an entrepreneur and a mom with a growing Italian family. After having son Lorenzo in August 2012 and daughter Giovanna in September 2014, Polizzi wed longtime boyfriend Gionni LaValle the following November. Both recently returned to the small screen as two DIY-ers on Nicole & Jionni's Shore Flip, which airs Wednesdays on FYI. Being television personalities and parents to two kids isn't enough for Polizzi or her beau—they both want another baby. "He wants to have one right now," she told E! News' Erin Lim. "We're ready for another one, just not like tomorrow." Snooki has one more stipulation about her future baby bump—she wants a second son. "I don't want any more girls. If I have a girl, I'm just going to be really upset about it," she admitted. As for that future little man, she already knows she wants to call him something Italian like Frankie, Rocco or Dino—essentially any name you'd hear on reruns of The Sopranos. READ: Where are the rest of those wild Jersey Shore kids today? Snooki is not the only castmate to become a mommy since the show ended. Her on-screen and off-screen BFF Jenni "JWoww" Farley gave birth to daughter Meilani in July 2014 and is currently expecting a son. Snooki would love to round up the old gang for an MTV 10-year reunion, though she's only sure of one thing if that get-together ever comes. "Me and Jenni would still be working together on our [YouTube] show," Snooki predicted. "She's still going to be my bestie." Though she did not divulge any juicy secrets on her former tanned pals, the mom of two does reveal the major revelation she relied on for shedding the weight. "[There is] no secret," she said frankly. "You need to go to the gym and eat healthy." There it is, plain and simple. 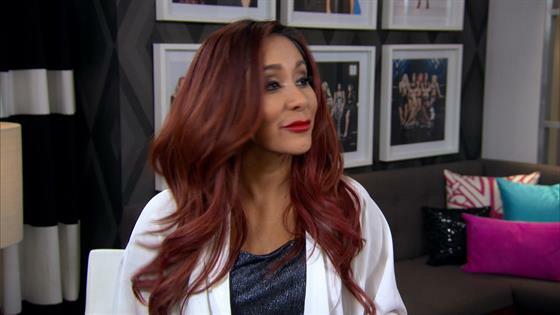 To find out how Snooki describes her own style evolution, watch E! 's clip below.